I have completely fallen in love with kale. It is so delicious, healthy and versatile. I have really enjoyed experimenting with a few different kale salads recently. In salads it is heartier and holds up better than lettuce but not quite as crunchy as cabbage. My most recent concoction is a delicious mix of sweet pears and cranberries, crunchy walnuts, and kale topped with balsamic vinegar and Parmesan cheese. Even my picky three year old who hardly eats any veggies will eat this salad! Which is saying a lot! To me this salad is perfect for fall and would be a great with soup or a casserole or even with Thanksgiving dinner. Chop kale into bite size pieces, place in a medium bowl. Massage kale gently with hands until darker and softer. Core pears and chop into small squares, I left the skin on mine you can peel them if desired. 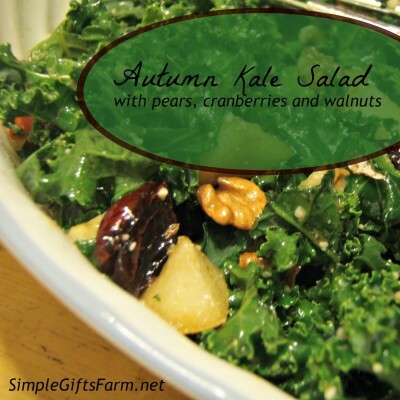 Add pears, cranberries, and walnuts to kale. In a small bowl whisk together olive oil, balsamic, sea salt and pepper. Add Parmesan cheese and toss again. Serve and enjoy!